Get a quick pulse on anything with our unbiased, diverse audience. Test market your options quickly and privately with our unbiased audience. 1 Minute Setup, Results In 10 Minutes! Have you tried home meal kit services? What are your impressions? I have not tried Home Meal Kit services, and I would rate them a 3 on that note. I feel that those services are not necessary for many people who do not mind going to the grocery store, which is nearly everyone. I think home meal kit services are not unique enough or worthwhile enough to get for the common person, it's difficult to imagine how else to go about running those type of services but the current model isn't working. I believe a subscription model giving free meals out per month, at least one per week (differing cuisines and variety) would be good. People love Japan Crate, all those other "crate" services that give items per month for a subscription price. It's all random items and the model works. I tried one last year that was given to me as a gift. It was a six month subscription. The meals sent me where nice meals, in some ways much more extravagant than I have cooked before. It made me try cooking things, and cook in ways, that I have not done before and probably would not have tried. These experiences can be challenging sometimes, but none are too difficult. The learning experience is nice and I have used some techniques on other dinners. It is also nice that I learned a lot more about some spices that I had not tried before. The one thing I did not like about the service is most of the meals are pretty small portions. What do you think about songs with vocals (singing)? Almost all songs that I listen to have vocals. I think that about 90% of the music on an album should have vocals, and then maybe a track or two could be instrumental only. I think that vocals can carry an otherwise generic track and make it something truly special. Only the most masterful of musicians can create such a stirring piece without vocals. So yes, most songs are better off with vocals. I think that songs with vocals are generally better. Only if the lyrics were thoughtfully written out and then performed very well by the vocalist. A very good instrumental song is Amazing all on its own, but if you can get a really good vocalist to record some very profound words over that instrumental then people would really resignate with this song More Than if it didn't have vocals. although there are definitely some great instrumentals ("classical gas," and "love is blue" come to mind since I'm over 60), I do think, generally speaking, that vocals are better. the lyrics add a dimension that can make a song a hit. I will admit that I don't think of myself as a "lyric" person but all in all they tend to be better. songs with lyrics are generally better as it allows for a more diverse sound. it also allows for the artist to communicate with their audience much more successfully. however, a pure instrumental song that can evoke the same feelings from a listener as a vocal song is something truly remarkable, but rare outside of the classical genre. As a freelancer, which problem is more painful? 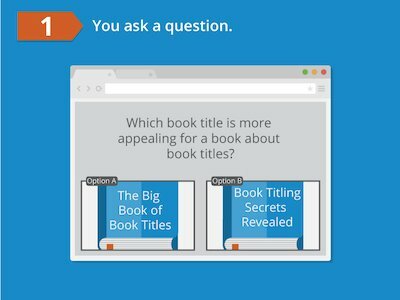 To me Option B is much more painful than Option A because when you are first creating your profiles you usually don't always have the "best" material to start your profile with. So, you end up using what you have to create the profile. When you first create a profile one tends to stumble through it, making mistakes and having to correct them. This can be very time consuming. Option A is not near as bad because updating is usually very quick, the format is already set and all you have to do is insert your updates. Much simpler then Option B.
I choose B because I believe it is more work when you are creating the freelance profile. I think making the profile is tedious because you need to put so much information and as they say it is a first impression on profiles like linked in, so you want to make sure you create the profile correctly the first time. Updating it is not that big a deal in my opinion because it does not require as much work it takes less time and is much less stressful. Have the recent Kavanaugh events changed how likely you are to vote this November? The recent events did change my view on how I am likely to vote. While I typically lean Democrat, I was considering voting for a Republican candidate. The conduct of the Republican party and the willingness to support an individual for a lifetime assignment to the Supreme Court who has shown himself to be partisan, one who circumvents questions and at times was not truthful, and conducted himself in an unbecoming manner by being disrespectful of Senators, reflects the core or the Republican party and power to influence individuals who might naturally think and vote differently. We need to break the grip of the Republicans, and ultimately, the sitting president. Yes, I was already planning on voting in November but I am all the more inspired to now. Kavanaugh getting confirmed for the court after his outburst during the senate hearings and his extreme partisianship were deeply concerning to me. The fact the GOP was still willing to go on with his confirmation after this display has illustrated to me they have no business being in power. How do you feel about about Brett Kavanaugh being sworn into the Supreme Court? We were railroaded into this. I watched every minute of him and Dr. Ford and he was hell bent on making sure he let everyone know he was out for revenge on the Clinton's and the Democratic party. I have no idea if it really happened or not, but just based on his actions in answering, diverting answers from questions he was asked, and being overall disrespectful to some of the people asking him questions, it is clear he is not level minded or fair and should have been disqualified as a Supreme Court Justice. I watched the vote yesterday as well on C-Span and my heart sunk. This country is doomed if it continues on this track. I don't necessarily disagree with his nomination or views on important issues, but I don't think he should have been voted in. Being suspected of sexual abuse isn't an automatic disqualification (especially if the claims are not substantiated or not corroborated by others). However, I think an excess of issues were going on with the process that a spectacle was made. I think another person should have been sworn in and not him. But obviously it is too late now. Kavanaugh is not suitable to be in the Supreme Court. He is a dishonest, over-emotional, immature person and that is not the type of person you want in the Supreme Court deciding what is constitutional and what isn't. The fact that he was sworn in even after being accused of sexual assault is a bad thing for women who are told to speak up about abuse because in this instance nothing positive came from that. What are the top 3-4 features that you use Facebook for? I really like using the friends as I get to see all my kids and grandkids pictures and see what they are doing. I also like the messenger for contacting family and friends love the video chat. I get to see my kids and grandkids while talking to them. I also like the marketplace, there is so much on there every minute it changes and adds more items for sale. You never know what you will find on there. So the top 3 for me is friends, messneger, and marketplace. I use it to see what my friends are doing, to follow people I enjoy reading their posts (celebs, media, etc), to find events locally and nationally that interest me as well as getting suggestions for services/goods in my area. I think facebook is more than just a social website as you can use it for so many other things now, but mainly I enjoy seeing what my friends' lives are up to and keeping current with a certain spectrum of people. When I do establish a Facebook page it will be for my online art gallery that will be under the company name, not my personal name. It will use it to annomously connect with friends, make business connections and promote my art. It will be an easy way to show my art to the young and old. I use Facebook to: 1. Chat with friends through Facebook Messenger; 2. Keep up with people's lives that I'm friends with through seeing their posts on my newsfeed; 3. To exchange contact information with people that I meet through sending friend requests; 4. To post photos of my travels. What is the biggest challenge for AI/ ML and data? testing this technology is tough because if people can't believe it is not something they can afford they won't try it and see how it can improve lives. It is expensive to create and test but up hurdle to get acceptance in the population. You need to target the right demographics. I am not a tech person, so I don't know the proper terminology, but I think the hardest part is teaching the technology to be aware of nuances and exceptions to rules. The power of humans is the ability to use judgment, which is something I don't think AI has. I believe formatting and annotating data would be the biggest challenge, due to the large amount of data needed to train a machine to learn by algorithm. I believe it would take a huge amount of time and effort to format and annotate that data. b) Formattin/annotating data. With a large community of people, there are going to be many ideas about organizing data in ways that "make sense". Identifying standards and, moreover, implementing them will be a difficult but necessary chore. Which sign up experience do you prefer on apps? In my experience I've had more issues trying to sign into apps that I linked to my Facebook account. I seem to get locked out of apps more often this way and it tends to be harder to resolve issues, where with my email I can easily get a new password sent if i need to. Much, much quicker. Logging in with Facebook is not only safe (I've never had a problem with it), but it saves me from having to memorize a password every time I want to sign up for something. I also frequently use Google one click. I choose B because it is a little less personal. I would rather put in the information in choice B than use my Facebook page as login because I do not know who will receive my information on the backend. I don't have or use Facebook so I prefer option B. Even if it was an account that I have, I dislike the thought of one login for multiple things as it makes the potential damage from hacking easier. I'll have to sign into my facebook anyhow and I don't want a bunch of websites connected to it. I like the left side as it's more convenient for me to type all my info in on a single page. I might be in the minority but I would rather sign up my email and password. I don't like connecting to my facebook as much. I feel a separate password is m ore secure. How do you feel about the recent policy of family separation for immigrants seeking asylum? It was happening under Obama and the media, nor the Democrats, said anything. I remember listening to Glenn Back back in 2014 talking about this very topic! Why is it now an emergency? Oh that's right...because it's Trump's fault. If the media thinks us Trump supporters are this dumb to believe them, they don't know what's coming when we vote in November.This is old, busted news. I feel like the Left just sits in a room spinning a bingo cage wheel with problems that have been around for decades...then pull one out once a month, blame it on Trump, offer zero solutions, then act like they're saving the world because they're upset all of a sudden.MAGA2020!!! I feel like it is an absolutely abhorrent policy, and there is no reason for it. It would be one thing to interview children (in their native language) separately from adults if the point was to make sure they weren't kidnapping victims, which is the only even slightly acceptable reason I've heard from the policy. It is another entirely to separate children from everything and everyone they know, isolating them and putting them in situations with masses of children in similar situations, not being cared for properly, and in situations that hearken back to the nazi era in far too many ways to be even slightly acceptable. How do you feel about iHop changing their name to iHob? I think that iHOP made a pretty dumb choice when deciding to change their name. Everyone seems to know their name and it is easy to remember because 'hop' is actually a word and sounds more complete when saying the business name out loud. Most people are familiar enough with the restaurant to know they're more than just pancakes - and judging by that, they also serve lunch and dinner type foods and that seems even less inclusive by just saying 'breakfast' now. I ranked my choice of bad idea first because I think it is, and the choice of great idea last because I disagree. Honestly, everyone already knows iHop- they know what it is and what to expect. I would be worried they would change more than just their name. Also, iHob just sounds really weird and i think iHop has a nicer ring to it. I also don't really care either way, although I think the name change is a bit weird, we don't eat at iHop frequently anyways so it won't really impact anything. I picked C because nothing is really going to change. The mere changing of a name for marketing purposes doesn't help with the quality of the food. I don't think people are going to go there simply because of a temporary name change. You either like ihop/ihob or you don't. They should've focused more on their new burgers rather than the strange temporary name change. It's your baby. Which one feels right? Send an email to your friends and family with the different options and ask for their feedback. Create a Google Ad or Facebook Ad for all the different options and see which one has the highest click-through rate (CTR). PickFu gets you the same quantitative and unbiased results as buying expensive ads, but much faster and without any of the hassle of trying to figure out how to setup the ads. As a bonus, you get written qualitative feedback you can use to further iterate on your options. Armed with this data, you will have the confidence to choose the best option. Start uncovering actionable, audience-driven data today. 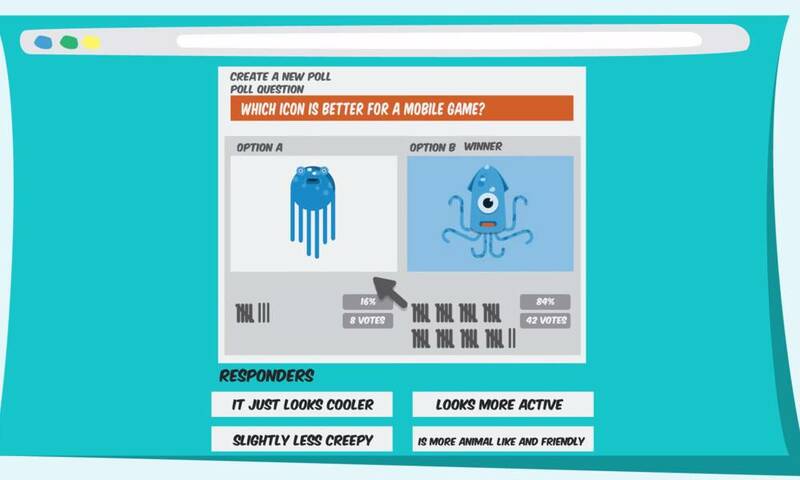 Just write one question and two answer options and your option poll is ready to go. Our respondents match US demographics, so you get balanced, unbiased results for your option. Keep iterating on your option throughout the day as you instantly get feedback you can use. Get an objective third-party point-of-view on your option. Learn the why behind each response and make better option decisions going forward. Slice and dice responses by age, gender, ethnicity, income, education. 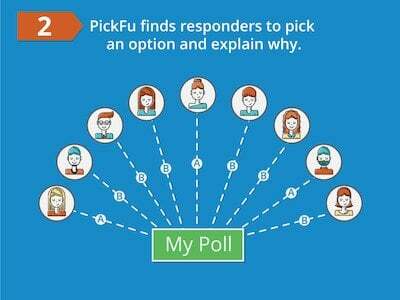 Join the thousands of customers using PickFu to optimize their options. Don't take our word for it — read their reviews of our other testing software or browse some real other polls. 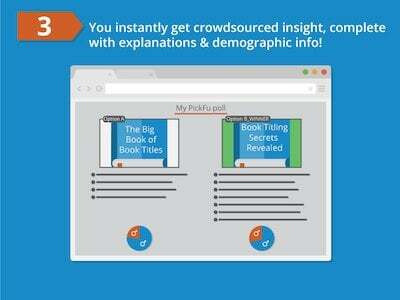 Learn how customers use PickFu for split testing.